For the first time in a home league game this season, Queens failed to score, as a stubborn and well organised Alloa side became only the second team to leave Palmerston with a share of the points. Queens attempt to make it eight league wins in a row was met with stubborn resistance as the game was dominated by both defences which resulted in very few clear cut scoring opportunities being created. Manager, Allan Johnston, made just one change to the team that started against Forfar a fortnight ago, as club captain Chris Higgins returned from illness to partner Mark Durnan at the heart of the defence, with Kevin Holt making way and moving to the bench. Visitors Alloa made one change to the team that began in last Saturday`s resounding 4-1 victory over Stranraer with Ranger`s youngster Calum Gallagher being replaced by Kevin Cawley. The game began in bright sunshine with Queens attacking the Terregles Street end of the ground and an early break saw Paul Burns find Chris Mitchell on the left, but his cross was just too high and sailed harmlessly out of play. Moments later, Danny Carmichael almost put top scorer Nicky Clark clear, but his pass was just the wrong side of the Queens striker and Alloa were able to clear the danger. The visitors almost took the lead when a shot from the edge of the area by Cawley hit the chest of Mark Durnan, but fortunately for Queens with Lee Robinson rooted to the spot, the ball spun inches wide of the far upright. It was then the turn of Queens to respond with an attack of their own, as shots from Burns,Clark and then Carmichael were all well blocked during a 30-second spell in which every effort from Queens was met by some excellent defending from the away side. On the quarter hour mark following a free-kick, Derek Young had a chance from just outside the box, but his shot was always rising and cleared the bar by some distance. By far the best chance of the opening spell for Queens came midway through the half when Carmichael latched on to the ball, burst clear of the defence and with only the `keeper to beat, dragged his low shot wide of the far post. 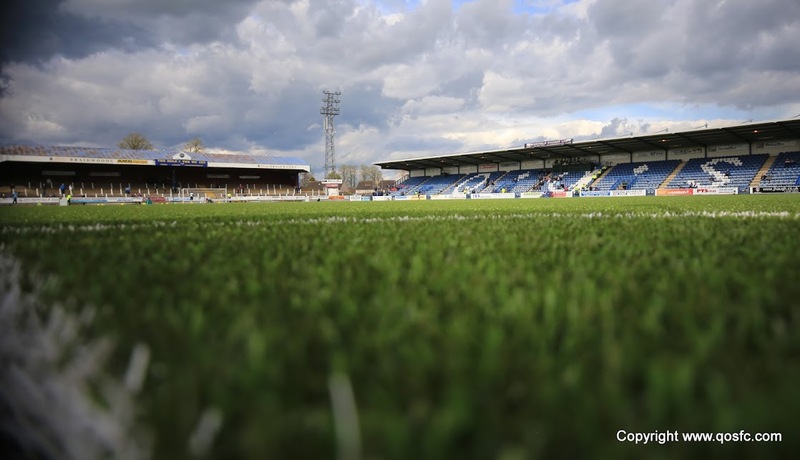 As the game switched to the other end, former Queens man Stephen Simmons, saw a header from 8-yards deflected over for a corner, and then almost straight away following Queens` first corner of the game, Ryan McGuffie was only inches away from connecting with Mitchell`s delivery. The game was very much an even encounter at this stage with Alloa being a tough nut for Queens to crack, and they were also showing that they were more than capable of hitting on the break, and on 33 minutes following such a break they had the best chance of the half to open the scoring. From a corner on the left, defender Ben Gordon rose highest of all to crash a far post header against the bar- a lucky escape for Queens. Five minutes from the break Queens were awarded a free-kick on the right touchline after a foul on Carmichael, and Mitchell`s cross found Clark who although getting in front of `keeper Bain, was unable to keep his header down and another chance had gone. A much better chance arose minutes later when McGuffie had what appeared to be a free header but his effort looped up and onto the top of the net. So the half ended goalless with very little to choose between the teams. The second period began in much the same way as the first had done, and it was Queens who were first to attack as the trickery of Clark won a free-kick some 22-yards from goal, and this time although the set piece was taken by the same player, Mitchell chose to shoot which forced `keeper Bain to make a very decent save, pushing the ball away for a corner which was ultimately defended well by the Alloa rearguard. Carmichael and Burns switched flanks as Queens looked for something different that might break the visitors, but to their credit, they kept their shape and the frustration amongst the home fans in the crowd of 1738 began to surface. Queens won another corner on the hour mark and although Clark got to the ball first, once again under strong pressure he was unable to direct his header on target. At the other end, Robinson produced an excellent diving save to keep out a powerful long range drive from full-back Meggatt as Alloa threatened to become the first team to win a league game at Palmerston this season. The first yellow card of the game was shown to Chris Mitchell for a foul on McCord in midfield after 63 minutes, and shortly afterwards Alloa`s Tiffoney received the same punishment for attempting to `swap` shirts with Carmichael down the right. It had been a fairly quiet afternoon for Queens leading scorer, Nicky Clark, but twice in the space of three minutes he came close to adding to his goal tally for the season. Firstly a close range effort was blocked away by the excellent Gordon, and then a shot from the edge of the box produced another good save from Alloa `keeper Bain as Queens battled to make the breakthrough. Yet another Mitchell corner almost brought reward for Queens, this time McGuffie`s header hit defender Meggatt on the line and was then cleared to safety. Gavin Reilly was sent on to replace Derek Lyle with seven minutes to go, and with a draw looking the most likely result, a moment of madness in the Queens defence almost cost them dear. A loose pass from Chris Higgins in midfield presented the ball to an Alloa attacker, and as the player went past him, Higgins hauled him to the ground to concede the free-kick. With the player through on goal, and Higgins being last man, it looked a certain red-card offence, but much to most people`s surprise a yellow was deemed as sufficient punishment, although the reaction of the Alloa players, management and fans, would suggest that they felt very differently. Having survived that decision, Queens still had to defend what was a dangerous situation, but thankfully the free-kick was blasted high and wide of the Queens goal. So the sides shared the points, and it was not hard to see why Alloa have now kept Queens from scoring in two out of three league games so far this season. Derek Young was named as sponsors man-of-the-match, and although the run of 7 consecutive league wins has come to an end, the gap at the top of the table is still a huge 16 points, with Queens very much in the driving seat. 14:35 Hello folks and welcome to a sun-drenched Palmerston as Queens host second-placed Alloa Athletic. 14:49 And today`s whistler is Crawford Allan assisted by flagwavers John McCrossan and Martin McCarthy. 14:56 We should have a good game today as Alloa are the only side to beat Queens in the league this season, winning 1-0 at Recreation Park. 15:01 Since that loss Queens have won 7 on the bounce whilst Alloa`s form has been a bit iffy with just 2 wins in their last 5. 3 min Queens have started on the front foot and have controlled the opening few minutes. 4 min Queens have begun in their usual 4-4-2 with McGuffie at right-back, Mitchell at left-back and Clark and Lyle up top. 13 min Derek Young shows a bit of class in the middle of the park as pulls off a nice back-flick to find McKenna. One for the showboat certainly. 20 min Big scramble in the Alloa area as Burns, Clark and then Carmichael each have efforts blocked by defenders. Committed defending from Alloa. 22 min Chance for Carmichael. He creates it himself as he knocks the ball over the top and beats the defender for pace but his shot is poor. 24 min Good defending there from Higgins as Simmons has a free header and the Queens captain positions himself well to block. 29 min It`s been a half of almosts from Queens as the final ball has eluded the home strikers when it looked like a chance would present itself. 30 min Off the bar! Alloa`s Ben Gordon rises to meet a corner kick and plants his header onto the crossbar but the home side survives. 38 min Almost from Clark as he beats the `keeper to Mitchell`s crossed free-kick but sends his header well, well over the crossbar. 41 min Big chance McGuffie. Queens have a free-kick in the corner and McGuffie is free in the middle but lands his header on top of the net. Half Time A very tight first half with few chances at either end. Alloa`s Gordon heading against the crossbar is the closest we`ve come to a goal. Half Time Today`s attendance is 1738. 51 min The second half has followed a similar vein to the first as neither team is able to break through stubborn defences. 54 min Great save! Mitchell`s free-kick is good and is heading for the corner before Bain in the Alloa goal dives to tip wide at full stretch. 58 min That effort from Mitchell has given the home side a bit of a boost as they have looked more dangerous when coming forward. 63 min Great save Robinson! 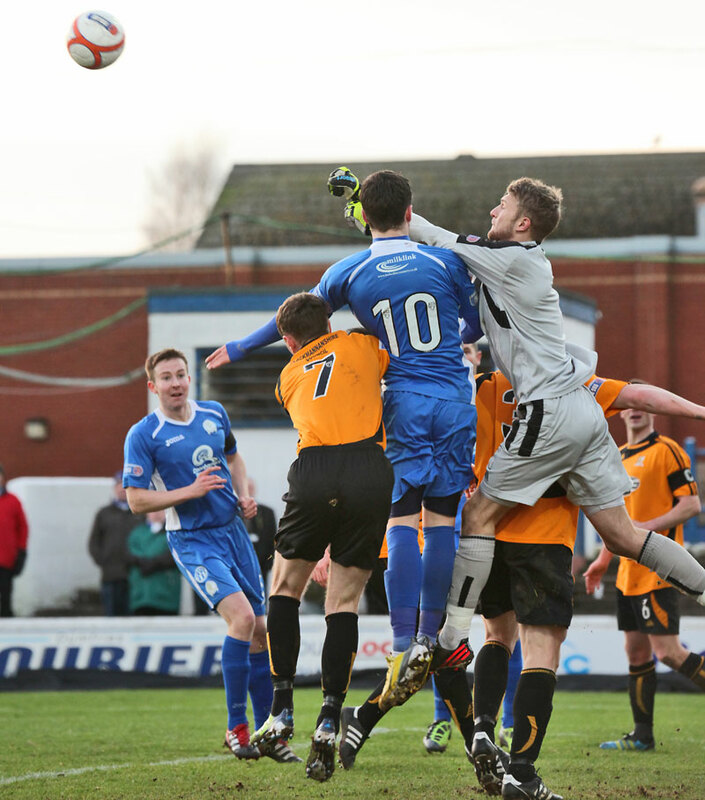 Alloa come forward and left-back Meggatt fires a rocket at the Queens goal but Robinson shows his agility and saves. 64 min Yellow Card : Chris Mitchell is in the book as he upends McCord in the middle of the park. 66 min Yellow Card : Alloa`s Tiffoney has a handful of Carmichael`s shirt and earns a yellow. 74 min Good effort Clark. Queens are knocking on the door now as Nicky Clark hits one from the edge of the box but Bain saves well. 82 min Off the line! Another set-piece as Mitchell sends in a corner and McGuffie sends a header toward the corner but hits the man on the post. 89 min Alloa have their second shot on goal of the half but Meggatt fires his free-kick high, wide and handsome. 16:51 Anything but a classic as the two defences held firm. 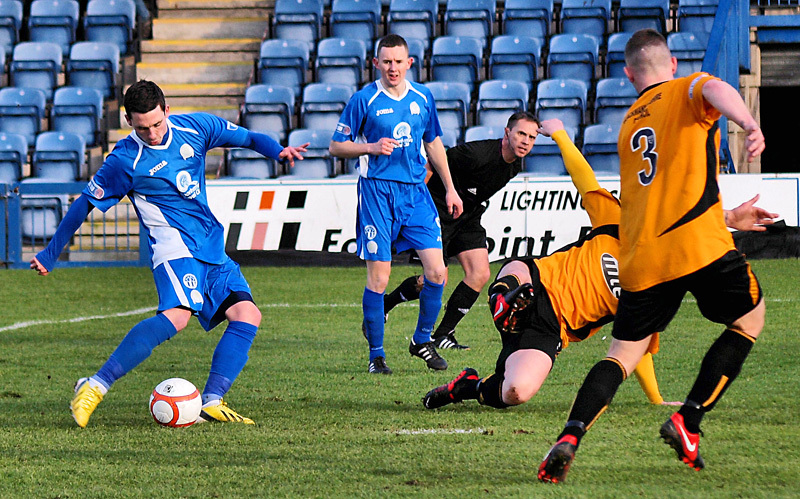 Queens had the better of it in the 2nd half but couldn`t find a way through.